UPDATE: We regret to inform you that Jack Million Casino is no longer open to Australian players. We recommend visiting our real money casino page for a complete listing of Aussie-friendly online casinos, bonuses, number of pokies, and more. 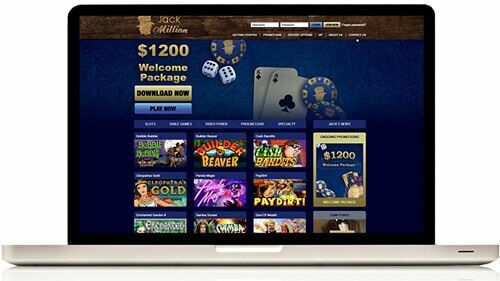 Jack Million online casino is a new option for Aussie gamblers. This recent addition to the Internet casino world hopes to break into the market and attract some new players. However, all new online casinos can struggle to attract players, as no one knows if the new kid on the block can be trusted. This is where we come in. Casino AUS has had a good look at what Jack Million brings to the table. So, the question that remains is: Should Australian gamblers jump on board with Jack Million? Keep reading to find out! One of the ways a new online casino can make a name for itself in a crowded industry is to offer a fantastic welcome bonus. Does Jack Million succeed in this situation? Yes, we think it certainly does. In total, there is AU$1200 available to new Aussie players creating their account. This $1200 welcome bonus is spread out over the first three deposits, with players able to earn 100% deposit bonuses each time. This gives players the freedom to deposit $1200 at once, if they want, or spread it out and deposit $400 at each of their three deposits. Players will need to enter the bonus code “WELCOMEJACK” before making their first deposit, though. There is a 30x wagering requirement on your bonus and initial deposit amount, so if you claim the full welcome bonus, you’ll need to wager $72 000 before you can start withdrawing your money. This is a fairly typical wagering requirement. Online pokies count 100% towards your wagering requirement, while table and card games count 25%, which is more than a lot of other online casinos allow. Jack Million online casino seems to be aware that welcome bonuses aren’t enough, as existing players need to feel appreciated as well. The casino offers several ongoing promotions, including a cashback promotion, which will allow players to get 10% of their losses back the following week. Existing players can also get a 50% deposit bonus for making a deposit on weekends. This bonus is valid for up to two deposits on the weekend and up to $500. On top of this, customer service is available 24 hours a day,7 days a week. This shows great potential for the casino, as not offering 24-hour support would put them at a severe disadvantage. The maximum amount a player can deposit at a time is AU$500, while the maximum withdrawal limit is $2000 per week. VIP players will get an increased withdrawal limit to $4000. Jack Million uses 128-bit SSL encryption to protect player’s details, and it is also licensed and regulated by Curacao, so players can feel safe using this casino. 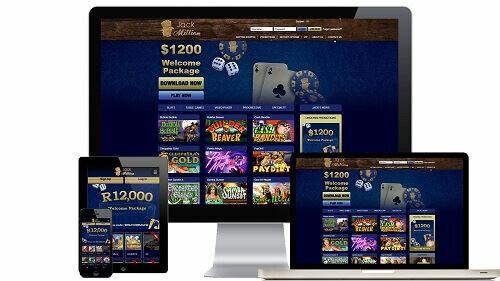 Jack Million is supplied by Real Time Gaming, which is a trusted name in casino game development. There are plenty of games available to play, including many online pokies and a selection of table games. The game selection isn’t quite as big as what you’d find at some other Internet casinos, but there is still more than enough on offer. Overall, we quite liked our time with Jack Million. The casino’s theme is fairly reserved, and it does everything it needs to. The customer service is great, and the game selection is more than adequate. It doesn’t push any boundaries at the moment though and is just a good all-round casino. We would have liked to see some live dealer games, but there isn’t much to fault the casino on. We give it a solid four out of five.